Combining observations from the CoRoT satellite and the ESO HARPS instrument, astronomers have discovered the first “normal” exoplanet that can be studied in great detail. Designated Corot-9b, the planet regularly passes in front of a star similar to the Sun located 1500 light-years away from Earth towards the constellation of Serpens (the Snake). Corot-9b passes in front of its host star every 95 days, as seen from Earth . This “transit” lasts for about 8 hours, and provides astronomers with much additional information on the planet. This is fortunate as the gas giant shares many features with the majority of exoplanets discovered so far . 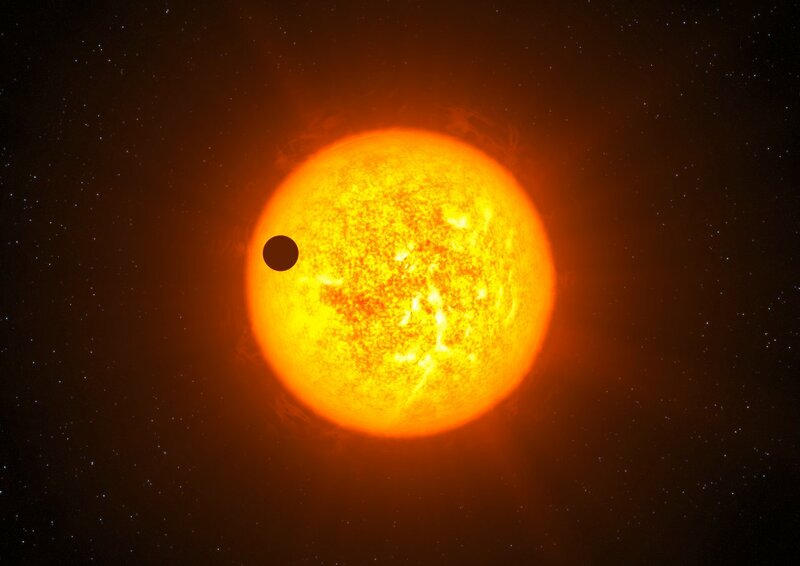 More than 400 exoplanets have been discovered so far, 70 of them through the transit method. Corot-9b is special in that its distance from its host star is about ten times larger than that of any planet previously discovered by this method. And unlike all such exoplanets, the planet has a temperate climate. The temperature of its gaseous surface is expected to be between 160 degrees and minus twenty degrees Celsius, with minimal variations between day and night. The exact value depends on the possible presence of a layer of highly reflective clouds. The CoRoT satellite, operated by the French space agency CNES , identified the planet after 145 days of observations during the summer of 2008. Observations with the very successful ESO exoplanet hunter — the HARPS instrument attached to the 3.6-metre ESO telescope at La Silla in Chile — allowed the astronomers to measure its mass, confirming that Corot-9b is indeed an exoplanet, with a mass about 80% the mass of Jupiter. This finding is being published in this week’s edition of the journal Nature. A planetary transit occurs when a celestial body passes in front of its host star and blocks some of the star’s light. This type of eclipse causes changes in the apparent brightness of the star and enables the planet’s diameter to be measured. Combined with radial velocity measurements made by the HARPS spectrograph, it is also possible to deduce the mass and, hence, the density of the planet. It is this combination that allows astronomers to study this object in great detail. The fact that it is transiting — but nevertheless not so close to its star to be a “hot Jupiter” — is what makes this object uniquely well suited for further studies. Temperate gas giants are, so far, the largest known group of exoplanets discovered. The CoRoT (Convection, Rotation and Transits) space telescope was constructed by CNES, with contributions from Austria, Germany, Spain, Belgium, Brazil and the European Space Agency (ESA). It was specifically designed to detect transiting exoplanets and carry out seismological studies of stars. Its results are supplemented by observations with several ground-based telescopes, among them the IAC-80 (Teide Observatory), the Canada France Hawaii Telescope (Hawaii), the Isaac Newton Telescope (Roque de los Muchachos Observatory), Wise Observatory (Israel), the Faulkes North Telescope of the Las Cumbres Observatory Global Telescope Network (Hawaii) and the ESO 3.6-metre telescope (Chile). This research was presented in a paper published this week in Nature (“A transiting giant planet with a temperature between 250 K and 430 K”), by H. J. Deeg et al. The team is composed of H.J. Deeg, B. Tingley, J.M. Almenara, and M. Rabus (Instituto de Astrofısica de Canarias, Tenerife, Spain), C. Moutou, P. Barge, A. S. Bonomo, M. Deleuil, J.-C. Gazzano, L. Jorda, and A. Llebaria (Laboratoire d'Astrophysique de Marseille, Université de Provence, CNRS, OAMP, France), A. Erikson, Sz. Csizmadia, J. Cabrera, P. Kabath, H. Rauer (Institute of Planetary Research, German Aerospace Center, Berlin, Germany), H. Bruntt, M. Auvergne, A. Baglin, D. Rouan, and J. Schneider (Observatoire de Paris-Meudon, France), S. Aigrain and F. Pont (University of Exeter, UK), R. Alonso, C. Lovis, M. Mayor, F. Pepe, D. Queloz, and S. Udry (Observatoire de l'Université de Genève, Switzerland), M. Barbieri (Università di Padova, Italia), W. Benz (Universität Bern, Switzerland), P. Bordé, A. Léger, M. Ollivier, and B. Samuel (Institut d’Astrophysique Spatiale, Université Paris XI, Orsay, France), F. Bouchy and G. Hébrard (IAP, Paris, France), L. Carone and M. Pätzold (Rheinisches Institut für Umweltforschung an der Universität zu Köln, Germany), S. Carpano, M. Fridlund, P. Gondoin, and R. den Hartog (ESTEC/ESA, Noordwijk, The Netherlands), D. Ciardi (NASA Exoplanet Science Institute/Caltech, USA), R. Dvorak (University of Vienna, Austria), S. Ferraz-Mello (Universidade de São Paulo, Brasil), D. Gandolfi, E. Guenther, A. Hatzes, G. Wuchterl, B. Stecklum (Thüringer Landessternwarte, Tautenburg, Germany), M. Gillon (University of Liège, Belgium), T. Guillot and M. Havel (Observatoire de la Côte d’ Azur, Nice, France), M. Hidas, T. Lister, and R. Street (Las Cumbres Observatory Global Telescope Network, Santa Barbara, USA), H. Lammer and J. Weingrill (Space Research Institute, Austrian Academy of Science), and T. Mazeh and A. Shporer (Tel Aviv University, Israel).